My oldest child must be overloaded on holiday stimuli. He’s quite naughty lately. Mischievous is more like it, but lately he’s been getting more checks on Santa’s naughty list vs. his nice list. We even have Jolly the elf, who reports to Santa daily on my children’s behavior, but that doesn’t seem to matter. Holiday mischief is winning at our house. 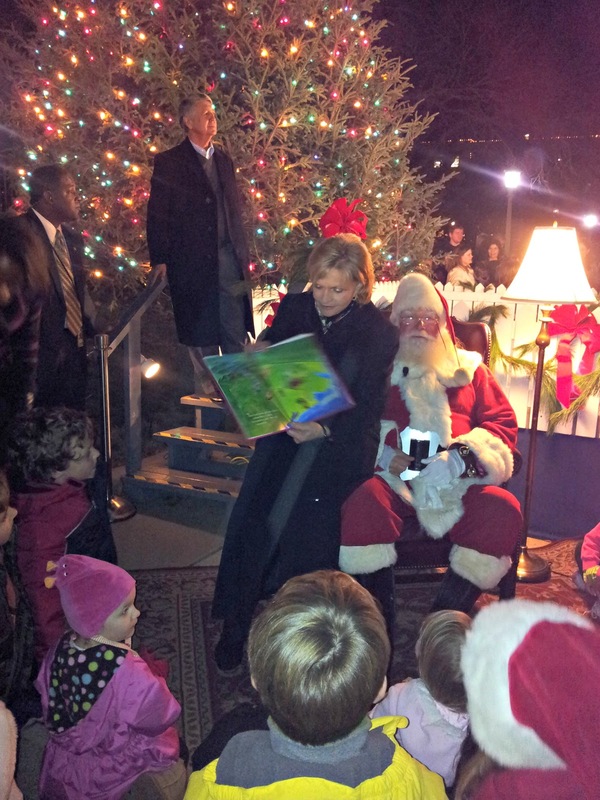 Even in front of the Big Man himself, and the governor of our state earlier this month, my 7-year-old acted naughty. He messed with his 3-year-old sister’s hood while she listened contently and sat in front of Gov. 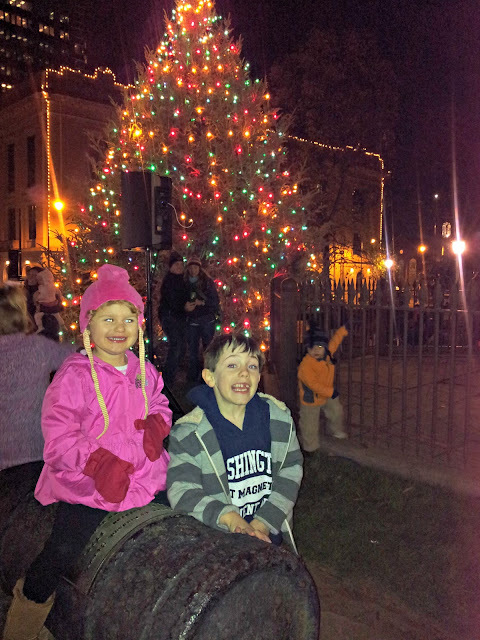 Perdue and Santa, as they told a North Carolina Christmas story at the annual Capitol tree lighting. NC Governor Beverly Perdue and Santa. Baby Diva is right in front. I mean, really! How embarrassing is it for a parent to see such uncalled-for mischief in front of VIPs? I sprung from the audience with a clatter to see what was the matter, but it was too late; my 3-year-old was upset by the hoodie fiasco. He didn’t mess with his sister just once, but twice. Her cap tumbled from her head, and she no longer acted nice. I grabbed his hand and scolded him like a disgruntled elf. There was no merry on my face, nor on my daughter’s face. She stood up and left her front row, coveted Santa position. Other children swarmed to her spot. Instead of being second or third in line to sit on Santa’s lap following the story, she was hatless and instantly became number 103. 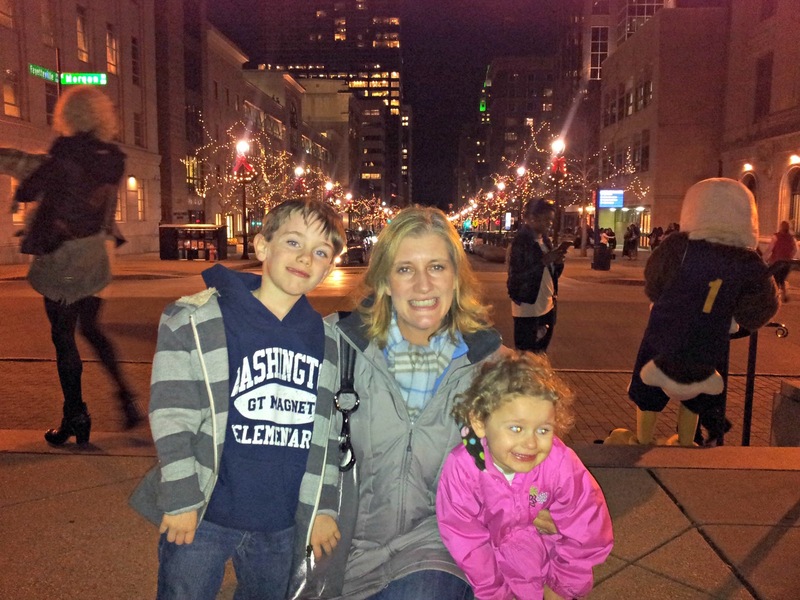 Without a second thought, I became the Grinch who stole Christmas because I decided to leave the festivities to prove the point to my oldest son that his behavior and mischief were not tolerated, especially in public. 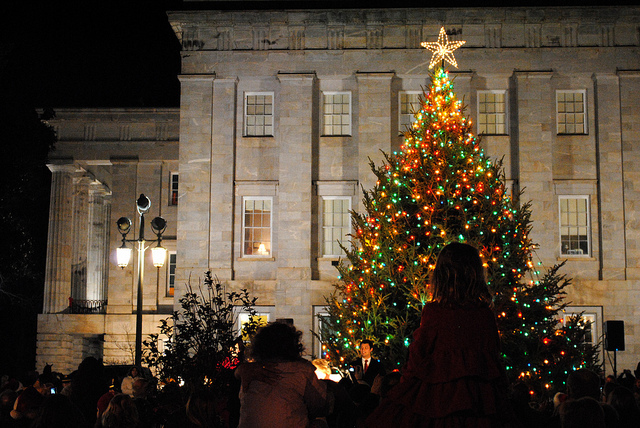 North Carolina's State Capitol Christmas Tree. It is 24 feet tall and is from Ashe County. In defense of my decision, my daughter really has not been deprived of seeing St. Nick. Neither has he. They both sat on Santa’s lap on a Sunday afternoon in Cary and again at a local restaurant. I even heard that he made a personal appearance to my daughter’s preschool this month. They’ve definitely had a lot of time to talk with Santa. She’s asked him many times for that bald baby doll on her list. Yes, I said bald. Santa, you better not come down our chimney with any doll that has hair on Tuesday. But despite her many rendezvous with Santa, she still was not a happy elf. She pouted. She laid on the ground in protest. Instead of just one naughty child, I was suddenly blessed with two. She almost cried. That is … until she saw a pig! 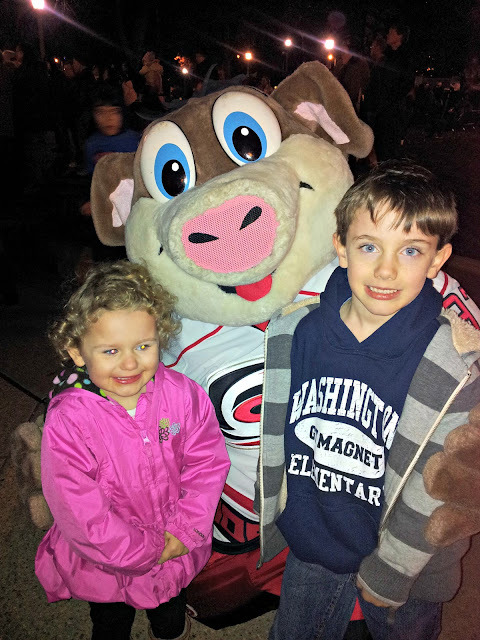 The Carolina Hurricanes mascot, Stormy. Unfortunately, NC State's mascot, Mr. Wuf, was in NY for a game. I guess you can say this holiday tale had a very happy ending with the glimpse of a pig’s tail. I’m certainly glad Stormy, the Carolina Hurricanes mascot, could be there for this festive occasion. With a professional hockey player’s strike, he’s not had much to do lately. That little fact was certainly a miracle on Morgan Street! So, for this little holiday tale, I guess you could say a pig trumped Santa. And, hopefully, a naughty little elf learned a valuable lesson on why he shouldn’t display public mischief. Mommy does not approve. It’s time for him to get on Santa’s nice list, and he did, the very next day. Thanks for giving me a little bit of your time each week. I wish your family a very Merry Christmas! It's been wonderful getting to know you this year.